Timberline Lodge, February 3, 2005, 25 inches of snow on the ground when there ought to be 150 to 200 inches! Bare ridges allowing summer-type hiking to well over 8,000 feet! It's Snow Drought 2004-2005. In a bigger context, the snow drought is part of an El Nino event far out in the Pacific, and the lack of snow in the mountainous areas mirrors an overall precipitation shortage that is hurting all of Oregon. It's of great interest to realize that such El Nino-related events create rather different living experiences for Oregon's people depending upon where they live within their State. For folks living in places like Salem, it's been like having the WORST OF BOTH WORLDS-- EXTREME DRYNESS LEADING TO A TERRIBLE SKI SEASON, FEARS OF SUMMER DROUGHTS AND FOREST FIRES, YET COLD AND GRAY AND MOIST ANYWAY, PROBABLY EVEN GRAYER THAN AN AVERAGE WINTER--- AND AS A BONUS, AROUND THE MAJOR METRO AREAS, THE EXTENDED PERIODS OF STAGNANT AIR HAVE LED TO WORSE THAN USUAL AIR POLLUTION LEVELS--- A VERITABLE FOGGY AIR POLLUTION SOUP. YUCK. 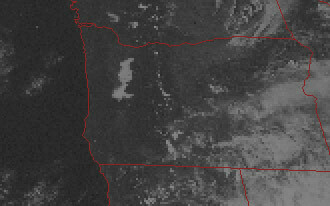 This mid-afternoon satellite image from Winter 2004-2005 is an excellent example of the El Nino-related persistent fogs that plague the Central Willamette Valley (see fog in left center of picture). Such fog occurs when the air is very stagnant due to basic stagnation, eg. no storms fronts coming and going...After lows of 28-31degrees each night, the fogged-in areas only rise to about 40 degrees, and this pattern can continue for 7-10 days at a time. It's pretty dismal. In Contrast, the chronic fair-weather low clouds that plague the Portland area during the summer months are not really fogs, but rather incursions of damp marine air that come up the Columbia River, usually during the summer months. 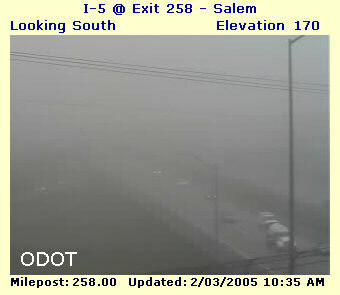 These type of low clouds often do not reach the Central Willamette Valley, leaving that part of the Valley basking in sunshine all day. Such winter season stagnation is why areas much south of Wilsonville/Canby aren't the best bets for astronomy viewing DURING THE WINTER MONTHS--- but the reverse is true during the summer months! Winter 1976-77 suffered a very severe snow drought. 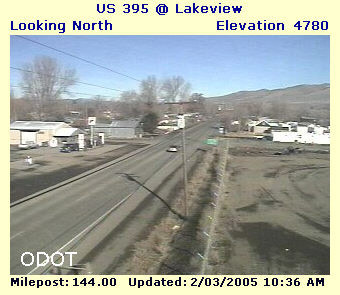 In my memory, it is "the worst" snow drought experienced in the Oregon Cascades during my lifetime...... 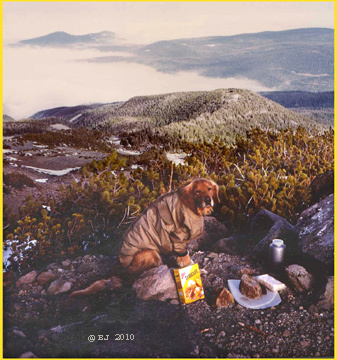 In early January 1977, I was able to drive a passenger car all the way up to 6000 feet on the mountain's NE side, to Cloud Cap Inn, and then hike to well over 7,300 feet on the Timberline Trail, mostly walking on frozen-solid pumice, but very little snow (see image of my dog sharing lunch with me at 7100 feet above Cloud Cap Inn)... In normal snow years, the road to Cloud Cap is closed all winter and doesn't become passable to cars until sometime in June... I have additional data and stories to post about winter '76-77; they come from a long-time employee of the Mt. Bachelor Ski Company. The winter of 1980-81 was also marked by a serious snow drought.... It seems pretty assured that Winter 2004-05 will soon be joining the "snow drought" record books (assuming that current long range forecasts are correct that this winter's much-subnormal snowfall continues for the remainder of the season). 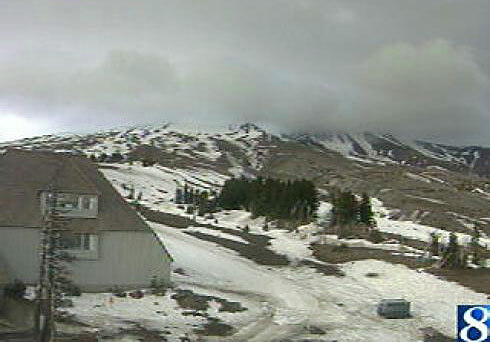 Update: March 5, 2005-- the image below shows the snow drought continuing unabated--- here is the front of 6,000 foot high Timberline Lodge this morning, looking barren. 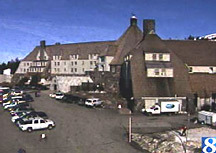 The Lodge in early March ought to be buried twenty feet deep, with the main entrance a dark, frozen tunnel into the central lounge area, lined with dripping, icy skiis and ski boots and other gear indicating that there are crowds of skiers inside the Lodge enjoying food and drink!